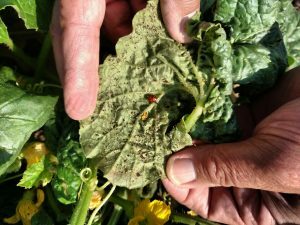 Over the past several weeks, there have been a number of reports of high populations of aphids on cucurbits, as well as report of disappointing levels of control with various insecticides. Without getting into the specifics of individual complaints, here are some suggestions for improved control of aphids. Remember that our primary method of control of aphids is natural enemies. There are a wide variety of predators and parasites than usually keep aphids at reasonable levels. Usually, an outbreak of aphids is an indication that a grower has done something to kill off the natural enemies, which allows aphid populations to reproduce unchecked. And, aphids have a very high reproductive capacity, so without those natural enemies they can build up in number very quickly. Obviously, there are other pests that cucurbit growers need to control, so some disruption of the natural enemies is to be expected. However, growers should only be spraying for pests like cucumber beetles when they exceed the threshold of 1 beetle per plant for cantaloupes and cucumbers and 5 beetles per plant for the other cucurbits. Throwing an insecticide in the tank because you are spraying fungicides rather than as a response to high beetle populations, is not a good idea. Not only are you likely to kill the natural enemies and create an aphid or mite outbreak, but we showed many years ago that cantaloupes sprayed weekly with a pyrethroid insecticide had lower yields than cantaloupes that were sprayed only when the threshold was exceeded. We don’t have exact thresholds for aphids like we do for cucumber beetles and other insects. Insecticides should only be applied when numbers are increasing. If you find a few aphids, mark the location in the field and come back 5 days later and see if the number has increased. If not, it may be that the natural enemies are doing their job. If they are increasing you should consider spraying. Remember that a few aphids will not affect the yield or quality of you crop. Make sure that there are enough to worry about. And, never spray for aphids preventatively. Confirm their presence and increase in numbers before treating. Planting time applications of neonicotinoid insecticides such as Admire Pro® or Platinum® will provide a number of weeks of control of aphids, more than the 3 weeks of cucumber beetle control that we get. Although we worry about the impact of those products on pollinators, they are effective aphid control materials. Beginning 3 weeks after planting when cucumber beetle number reach the threshold, an application of one of the pyrethroids is appropriate for cucumber beetle control. If both aphids and cucumber beetles are issues, then the choice of a product that works for both, such as Assail®, would be appropriate. One of the reasons we often recommend Assail® over Actara® is because of lower potential for harm to pollinators. If only aphids are the issue, growers should consider one of the more specialized aphid insecticides, such as Beleaf®, Exirel®, Fulfill®, or Sivanto®. Although many aphids can be observed on this cantaloupe leaf, lady beetles are preying on aphids and several aphids have been parasitized by a small wasp.